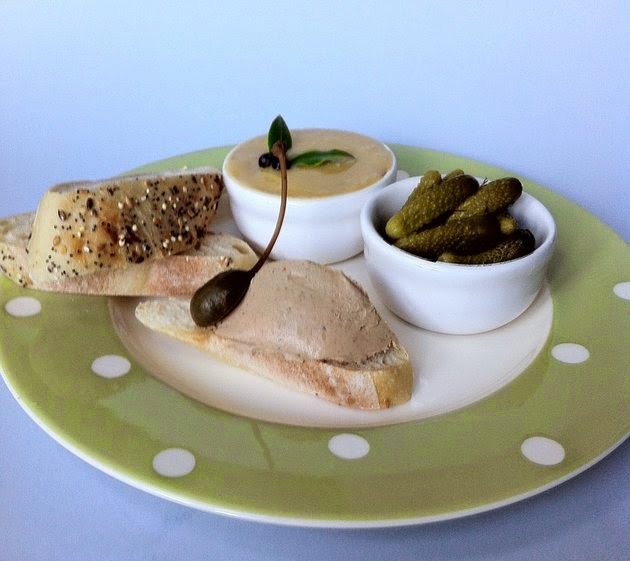 There is no slaving over a hot cooker with this delicious Chicken liver paté that take less than 15 mins to cook, leaving you plenty of chill out time with friends.Whether served as a starter or as canapés, nothing beats the traditional Chicken liver paté served with crusty bread, Melba toasts and assorted pickles. Heat a large frying pan over medium heat. Add the some of the butter and the oil. Next add the shallots, garlic, chilli flakes and thyme. Cook until soft and aromatic. Drain the chicken livers and add to the pan. Cook for a further couple of mins. Pour in the brandy and continue to cook until evaporated. Blitz the mixture with the cream and the remaining butter until smooth. Season to taste and blitz again. Push the mixture through a sieve and spoon into ramekins. Allow to cool slightly and coat with a thin layer of clarified butter. Garnish with a couple of juniper berries/ pink peppercorns and a small bay leaf . Refrigerate until firm. Serve with crusty bread and pickles as a starter or turn into small quenelles over toasted bread for canapes.